UNITED NATIONS, July 15 -- With the UN Security Council set to meet together on Afghanistan and churn out another statement of hope about the elections, the UN Secretariat and Mission in Afghanistan are dodging straightforward questions about the UN's role in not acting on mass graves of victims of Hamid Karzai ally General Abdul Rashid Dostum. It has been reported that "in 2008, a medical forensics team working with the United Nations discovered excavations that suggest the mass grave had been moved." Question: I also wanted to ask you... about the U.S. role in not investigating a mass grave created by General [Abdul Rashid] Dostum in Afghanistan, who was a major player there. In the middle of the article, it says in 2008, a medical forensic team working with the United Nations discovered excavations that a mass grave had been moved. I guess I wanted to know -- and you may not know it off-hand -- what did you, the UN, do when it reportedly found this evidence of a mass grave? The article is very much alleging a U.S. cover-up. But I want to know, what did the UN do? Deputy Spokesperson Okabe: We’ll check on that for you. But on July 15, minutes before the Security Council started meeting, the UN Spokesperson's office sent an answer which entirely avoided the question of the UN's 2008 forensic team finding. * UNAMA has repeatedly called for all alleged crimes and past abuses to be investigated (not just individual cases) as part of Afghanistan's own transitional justice action plan on Peace, Reconciliation and Justice. * We welcome indications from US authorities that they will investigate this incident. 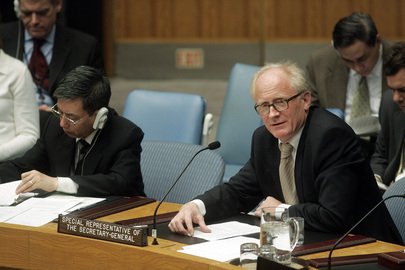 The Special Representative, Kai Eide only recently made clear that "if we fail to address the crimes of the past then we face serious problems for the future"
* UNAMA's mandate is to assist the Afghan authorities with these efforts and as part of this the mission facilitated several forensic missions by the NGO Physicians for Human Rights (PHR) to the site in 2002. Since then we have also asked for the Government to protect the site for future investigations and offered to support the Government with their investigations. * In a briefing to the UN Security Council the then SRSG, Lakdar Brahimi referring to this specific incident stated that it was fairly certain that "a large number of people died in, to say the least, suspicious circumstances"
So, then-UN envoy Lakhdar Brahimi spoke about it, some time ago, and the UN facilitated an NGO's forensic mission -- in 2002. But what did the UN do when "in 2008, a medical forensics team working with the United Nations discovered excavations that suggest the mass grave had been moved"? Watch this site. UNITED NATIONS, July 1 -- While Paddy Ashdown, who had been slated to be the UN's "Super-envoy" to Afghanistan until President Hamid Karzai shot down the idea, says that the war against the Taliban is being lost, Karzai's Ambassador to the UN Zahir Tanin on June 30 wry told the Press that "people have different views." He became more expansive when Inner City Press asked, "Some are saying that President Karzai is assembling a war lord ticket, Mr. Fahim in particular, and that ministries have to promised to supporters." Video here, from Minute 501. Ambassador Tanin said, "This is what we read. There are political players in Afghanistan... Whether you call them warlords or not... Any candidates including President Karzai try to have their support... if not with Karzai, other candidates will try to have them with him." Tanin went on, "they have "influence.... if they support one or another incl President Karzai, it is very different than the idea of warlords on one side and non warlords on other." While Tanin left the stake out after this statement, it seems fair to summarize it as a preference by the Karzai administration to have the warlords inside his tent rather than outside. But how far does this go? The UN's envoy to Afghanistan Kai Eide briefed the Security Council, but walked by without stopping at the stakeout microphone where Tanin was to speak. Part of a UN envoy's job is to speak and explain his positions. His deputy Peter Galbraith has also yet to speak to the press. Watch this site. 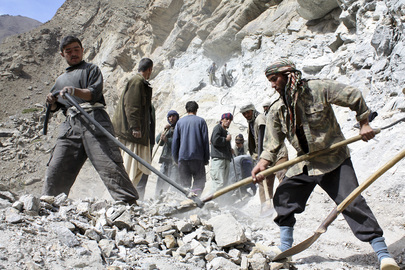 UNITED NATIONS, May 10 -- As civilians are killed in attacks on the Taliban in Afghanistan and Pakistan, the UN in New York last week dodged questions on the former. 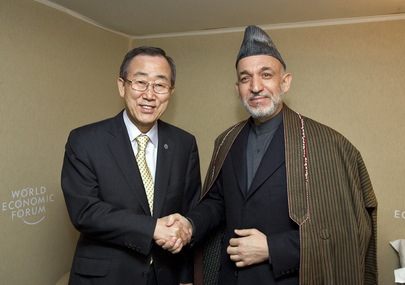 Inner City Press asked, did the UN's Kai Eide urge Hamid Karzai not to appoint an alleged war criminal as his running mate? The UN would not answer. Why hasn't Eide's new American-suggested deputy deployed yet? The UN claimed that he'd begun on a delay: but that's not what his appointment press release said. The UN dodged on Congo, too, where it works with an indicted war criminal, and on the blocking of cash into Gaza. Same on the cancellation of investigations in Kosovo. It was just another week at the UN. Inner City Press: On Afghanistan, there are these reports that Kai Eide met with Hamid Karzai and asked him not to appoint Mohammed Farhim as his running mate, given human rights concerns against him. Can you confirm that that Kai Eide did that? It quotes a UN, a diplomatic source near Eide as saying that. Deputy Spokesperson Okabe: I have seen the press reports, but I don’t have anything on that. Through the rest of the week, nothing else was said. See below on the non-appearance of Eide's deputy Peter Galbraith. Inner City Press: On UNRWA as well, in his meeting, did the issue... UNRWA has said that Israel doesn’t allow cash to UNRWA to pay its own staff members and to give small grants to Palestinians in Gaza Strips and also imposes, I think a tax; does not allow them to bring in materials as they do elsewhere in the world. I’ve been told that the Secretary-General has raised this issue with Israel. Did this issue come up, and what was Israel’s response? Spokesperson Montas: Not in this meeting, no. Not that I know of. Inner City Press: And can we find out, from UNRWA I guess, whether this is still, this remains the case; the difficulty of getting... [inaudible]? Spokesperson: Of course, we can try to get that information for you. Spokesperson Montas: I cannot confirm it at this point. I can ask, of course, Mr. Adlerstein to answer your question. Inner City Press: There are these reports that the UN has decided to drop any investigation of irregularities in privatizations in Kosovo during UNMIK’s [United Nations Mission in Kosovo] time. I am sure you’ve seen these reports. I wonder, the reports said that the UN investigators had recommended criminal investigation, but now it’s all being dropped without anything. And I wanted also, related to that, to know whether the UN is tracking the involvement in privatizations of its former envoys to Kosovo such as Steven Schook and others. Or is that part of the UN’s...(inaudible)? Associate Spokesperson Haq: Well, first of all there were a certain number of investigations that took place by a group, the Investigative Task Force, which was established through UNMIK regulations and was comprised of representatives of the UN, through the Office of Internal Oversight Services, the European Anti-Fraud Office, and the Financial Investigation Unit. The Special Representative of the Secretary-General acted appropriately on all of the recommendations of the Task Force, which issued its last report in June 2008. The actions taken by the Special Representative included referring cases to the Department of Justice and forwarding recommendations to Pillar IV of UNMIK. As a result of the Investigative Task Force’s recommendations, criminal investigations were conducted and proceedings were initiated against personnel who were found to have committed criminal offenses. The Department of Justice ceased operations and all of the Department’s case files have been handed over to the European Union Mission in Kosovo. Any further criminal sanctions would have to be pursued by that mission's investigators and prosecutors. Inner City Press: I also wanted to know, you mentioned Kai Eide. It’s a small thing, but Mr. [Peter] Galbraith, who was named his Deputy, is speaking at some commencement on 16 May in New England. When is he going to actually deploy to Afghanistan? When is his beginning day? 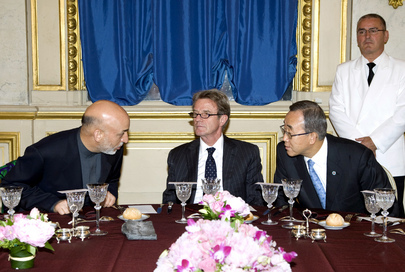 Is he already a UN staff, and if so, why isn’t he in Afghanistan at this moment? Associate Spokesperson Haq: I believe when we mentioned the announcement we mentioned when he would start his duties. He’s already participated in preparation for taking up his duties; he almost immediately participated in some of the meetings on Afghanistan that took place about a month ago. So he’s already taken up some of his duties in that regard. Inner City Press: I guess what I am saying is, has he already made the transition? Does he have a UN pass, privileges and immunities, Laissez-Passer, is he being paid? Associate Spokesperson: I believe we mentioned his starting time at the announcement, so you’d have to go back to our announcement and that would let you know. And with that, I wish you a good afternoon. Inner City Press: Marie, on this issue of whether the UN and its Mission in the Congo, MONUC, are aware of indicted war criminal Bosco Ntaganda working with the Congolese Army, the minutes have come out of an 4 April meeting of the Congolese Army in which it is said that Bosco Ntaganda participated in the meeting, took the floor as adjunct coordinator of this operation, and spoke. And so I am wondering, is… earlier, I think on 29 April, Farhan Haq had said “well, we haven’t seen the document, but we have been given assurances…” Now that these minutes… Does the UN dispute that minutes from the Congolese Army show that Bosco Ntaganda is the adjunct coordinator of the operation? Deputy Spokesperson: I don’t have anything beyond what was already said on the subject. [The correspondent was later reminded that he had already been given the following guidance last week: “The United Nations Organization Mission in the Democratic Republic of the Congo (MONUC) has not seen the documents referenced in the media report allegedly showing that Jean-Bosco Ntanganda is a part of the joint operation. On the contrary, the Democratic Republic of the Congo authorities have shown MONUC relevant documents defining the operation’s command structure, which does not make any mention of Mr. Ntanganda.